Sainted Nicholas, Archbishop of Myra in Lycia, and Wonderworker is famed as a great saint pleasing unto God. He was born in the city of Patara in the Lycian region (on the south coast of the Asia Minor peninsula), and was the only son of pious parents Theophanes and Nonna, who had given a vow to dedicate him to God. As the fruition of longtime prayer of his childless parents, the infant Nicholas from the very day of his birth revealed to people the light of his future glory as a wonderworker. His mother, Nonna, after giving birth was immediately healed from illness. The newborn infant while still in the baptismal font stood on his feet three times, without support from anyone, indicating by this to honour the MostHoly Trinity. Saint Nicholas from his infancy began a life of fasting, and on Wednesdays and Fridays he accepted milk from his mother only but once, after the evening prayers of his parents. From the time of his childhood Nicholas thrived on the study of Divine Scripture; by day he would not leave church, and by night he prayed and read books – fashioning in himself a worthy dwelling-place of the Holy Spirit. His uncle, Bishop Nicholas of Patara, rejoiced at the spiritual success and deep piety of his kinsman. He ordained him a reader, and then elevated Nicholas to the dignity of presbyter, making him his assistant and entrusting him to speak instructing the flock. In serving the Lord the youth was fervent of spirit, and in his proficiency with questions of faith he was like an elder / starets, which aroused the wonder and deep respect of believers. Constantly at work and vivacious, being in unceasing prayer, presbyter Nicholas displayed great kind-heartedness towards the flock, and towards those afflicted coming to him for help, and he distributed all his inheritance to the poor. Having learned about the bitter need and poverty of a certain formerly rich inhabitant of his city, Saint Nicholas saved him from great sin. Having three grown daughters, the despairing father considered to give them over to profligacy so as to save them from hunger. The saint, grieving lest the man perish a sinner, by night secretly brought him through the window three sacks with gold and by this saved the family from falling into spiritual destruction. In bestowing charity, Saint Nicholas always strove to do this secretly and conceal his good deeds. Having reached the ancient city of Jerusalem and having come to Golgotha, Saint Nicholas offered up thanksgiving to the Saviour of the race of mankind and he made the rounds of all the holy places, doing poklons and making prayers. By night on Mount Sion the closed doors of the church opened by themselves in front of the arriving great pilgrim. Going round the holy places connected with the earthly service of the Son of God, Saint Nicholas decided to withdraw into the wilderness, but he was stopped by a Divine voice, urging him to return to his native country. Having returned to Lycia and yearning for a life of quietude, the saint entered into the brotherhood of a monastery, named Holy Sion. But the Lord again announced another pathway, awaiting him: "Nicholas, this is not the field, on which thou ought to await Mine harvest, but rather turn round and go into the world, and there My Name shalt be glorified in thee". In the vision the Lord gave him a Gospel of exquisite workmanship, and the MostHoly Mother of God – an omophor. And actually, upon the death of archbishop John, he was chosen bishop of Lycian Myra – after one of the bishops of the Council gave a decisive reply on the question of choice of a new archbishop – the choice of God as directed him in a vision – Saint Nicholas. Summoned to the flock of the Church in the dignity of archbishop, Sainted Nicholas remained a great ascetic, appearing to his flock as an image of gentleness, kindness and love towards people. This was particularly precious for the Lycian Church during the time of persecution of Christians under the emperor Diocletian (284-305). Bishop Nicholas, locked up in prison together with other Christians, sustained them and exhorted them to bravely endure the fetters, punishment and torture. He himself the lord preserved unharmed. Upon the accession to rule of the holy equal-to-the-apostles Constantine, Saint Nicholas was restored to his flock, which joyfully received back their guide and intercessor. 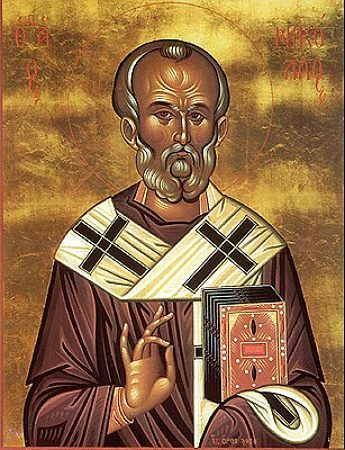 Saint Nicholas, in the heat of denunciation and fired up with zeal for the Lord, even gave the false-teacher a good drubbing on the ears, for which he was deprived of his bishop's omophor and put under guard. But several of the holy fathers shared a vision revealing that the Lord Himself and the Mother of God had made the saint to be bishop, bestowing upon him the Gospel and omophorion. The fathers of the Council, having concurred, that the audacity of the saint was pleasing to god, gave glory to the Lord and restored His holy saint to the dignity of bishop. The name of the great saint of God, the hierarch and wonderworker Nicholas, a speedy helper and suppliant for all hastening to him, is famed in all the ends of the earth, in many lands and among many peoples. In Russia there are a multitude of cathedrals, monasteries and churches consecrated in his name. There is not, probably, a single city without a Nikol'sk temple. In the name of Sainted Nicholas the Wonderworker – the first Russian Christian prince Askol'd (+ 882) was baptised in 866 by Patriarch Photios. Over the grave of Askol'd, the holy equal-to-the-apostles Ol'ga (Comm. 11 July) erected the first temple of Sainted Nicholas in the Russian Church at Kiev. Primary cathedrals were dedicated to Saint Nicholas at Izborsk, Ostrov, Mozhaisk, and Zaraisk. At Novgorod the Great one of the main churches of the city – the Nikolo-Dvorischensk church, later became a cathedral. Famed and venerable Nikol'sk churches and monasteries are at Kiev, Smolensk, Pskov, Toropetsa, Galich, Archangelsk, Great Ustiug, Tobol'sk. Moscow was famed by several tens of churches consecrated to the saint, and three Nikol'sk monasteries were situated in the Moscow diocese: the Nikolo-Greek (Staryi) – in the Chinese-quarter, the Nikolo-Perervinsk and the Nikolo-Ugreshsk. One of the chief towers of the Kremlin was named the Nikol'sk. Part of all the churches devoted to the saint were those established at market-squares by Russian merchants, sea-farers and land-goers, venerating the wonderworker Nicholas as a protector of all those journeying on dry land and sea. They sometimes received the name among the people of "Nicholas soaked". Many village churches in Russia were dedicated to the wonderworker Nicholas, reverently venerated by peasants as a merciful intercessor before the Lord for all the people in their work. And in the Russian land Saint Nicholas did not leave off with his intercession. Ancient Kiev preserves the memory about the miraculous rescue of a drowning infant by the saint. The great wonderworker, hearing the grief-filled prayers of the parents in the loss of their only child, by night snatched up the infant from the waters, revived him and placed him in the choir-loft of Saint Sophia church in front of his wonderworking image. And here in the morning the infant was found safe by his thrilled parents, praising with a multitude of the people Saint Nicholas the Wonderworker. Many wonderworking icons of Saint Nicholas appeared in Russia and came also from other lands. There is the ancient byzantine embordered image of the saint (XII), brought to Moscow from Novgorod, and the large icon written in the XIII Century by a Novgorod master. Two depictions of the wonderworker are especially distributed in the Russian Church: Sainted Nicholas of Zaraisk – in full-length, with blessing right hand and with Gospel (this image was brought to Ryazan in 1225 by the byzantine princess Eupraxia, future spouse of Ryazan prince Theodore, and perishing in 1237 with her husband and infant-son during the incursion of Batu); and Sainted Nicholas of Mozhaisk – also in full stature, with a sword in his right hand and a city in his left – in memory of the miraculous rescue, through the prayers of the saint, of the city of Mozhaisk from an invasion of enemies. It is impossible to list all the graced icons of Saint Nicholas. Every Russian city and every church was blessed by suchlike icons through the prayers of the saint.